Kevin Garnett and Memphis Grizzlies rookie Jaren Jackson Jr. pose for a photo during a training session while filming for TNT's Area 21 in the Built Ford Tough Training Facility in Memphis, TN. That word emphatically shot out of Kevin Garnett’s mouth. Then, the former NBA superstar leapt from his seat with both arms raised above his head as if he were clutching a basketball. Seated next to Garnett inside the Grizzlies’ film room on a recent afternoon, Jaren Jackson Jr. flinched at the sudden burst of energy, motion and emotion Garnett flashed as the play unfolded on the screen. “Stop it there for a second,” Garnett demanded as the video was paused just as Jackson caught a mid-post entry pass during a Jan. 21 game against the Pelicans. A week has passed since Garnett dropped by to personally check in on Jackson midway through a turbulent but encouraging rookie season. 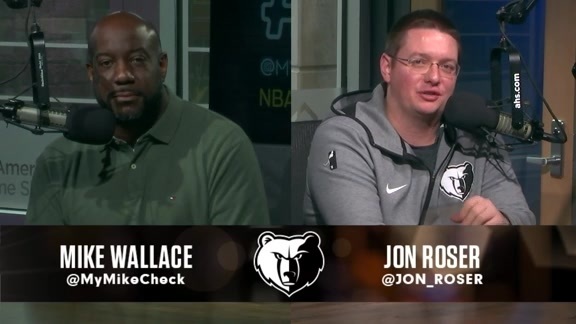 Jackson intends to continue implementing some of Garnett’s tips and tutelage as the Grizzlies wrap up a five-game homestand Monday against the Nuggets. Jackson has already shown stronger signs of vocal leadership and a more precise offensive approach the past few games. In one of his best games this month, Jackson's 20 points on 57.1 percent shooting, six rebounds, two assists and a steal in 31 minutes helped the Grizzlies halt a season-long, eight-game losing streak with Saturday’s 106-103 win over Indiana. But the seeds that sprouted in Jackson’s performance Saturday were planted back in the Grizzlies’ film room four days earlier. 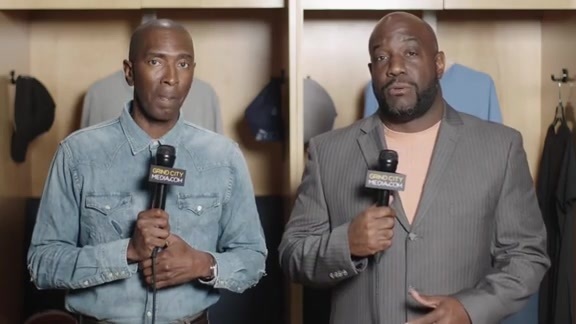 That’s when Garnett settled in for a daylong session with Jackson that will be featured Tuesday on KG’s Area21 segment during TNT’s national double-header broadcast of games. Garnett’s use of “grasshopper” with Jackson oozes with symbolism. A 15-time NBA All-Star, nine-time All NBA first-team pick, 2008 NBA champion, 2004 MVP and soon-to-be Hall of Famer, Garnett knows every angle of the game. His “grasshopper” is a signature gather motion, with elbows extended, to set up an offensive move. He was reaching into his extensive bag of tricks to share with Jackson. In another sense, ‘grasshopper’ is the term of endearment a master teacher uses to refer to a supremely talented understudy. The moniker was popularized on the 1970s martial arts TV drama, ‘Kung Fu.’ It applies here, between an NBA legend and a 19-year-old franchise cornerstone. Garnett, 42, has taken Jackson under his wing the past year. The midseason visit to Memphis was the second time in eight months that one of the greatest power forwards in NBA history took time to personally meet with Jackson for a tune-up on and off the court. Over two days last week, Garnett sat courtside and watched Jackson as the Grizzlies suffered a 20-point loss to the Pelicans. The next day, Garnett visited practice and also spent time with Jackson in the film room before the two returned to the practice court for their own brief workout together. Garnett also mentored Jackson last summer in California just before June’s NBA Draft, where the 6-11 power forward out of Michigan State was selected fourth overall by the Grizzlies. Back then, Garnett and Jackson hiked the sprawling Calabasas Stairs. Jackson has since ventured halfway through his NBA rookie season journey. This time, Garnett visited Memphis to see how well Jackson was adjusting. It’s even cooler when Garnett gets heated. Still close to his wiry NBA playing shape, the 7-foot Garnett was often animated and in constant motion as he demonstrated moves, positions and angles for Jackson to apply. In the rare moments his body stopped for a few seconds, Garnett’s mouth still kept firing – spraying golden nuggets of wisdom as Jackson tries to balance the progress he’s made amid his team’s painful stretch. Garnett arrived at a tumultuous time. Memphis entered this week having lost 14 of its last 16 games, and franchise pillars Mike Conley and Marc Gasol have been informed the team is fielding offers for them as the Feb. 7 trade deadline looms. The Grizzlies (20-30) carry the second-worst record in the West into Monday’s visit from the second-place Nuggets (33-15). Ironically, Jackson is in the midst of his most productive scoring month as the team closes out January this week trying to build on Saturday’s breakthrough. He averaged 15.4 points, 4.6 rebounds and a block on 52.6 percent shooting in 27.8 minutes through 14 January games. Midway through the season, Jackson led all rookies in blocks, ranked second in field-goal percentage, was fourth in steals and fifth in scoring. I was just telling your coaches that every team goes through a point like this in the season. But the realest thing is that it’s important you keep true to who you are. He’s been statistically impressive, but realistically dissatisfied. From that standpoint, special visitors couldn’t have hit town last week at a better time. The two former players Jackson is most compared to are Garnett and Chris Bosh, who entered the NBA when traditional, low-post big men dominated the league. But they both helped to usher in an era in which bigs have stretched their shooting to three-point range, handle the ball like guards and defend multiple positions. Jackson represents the latest evolution of that prototype. So it was only fitting that both Garnett and Bosh, from floor seats at opposite ends of the court, watched Jackson closely during the Martin Luther King Jr. Celebration Game. At his best, Jackson combines Bosh’s shooting with Garnett’s defensive prowess. Bosh, a seven-time All-Star and two-time NBA champion, also likes what he’s seen in Jackson so far. Jackson soaks it all up. There’s no shortage of pointers that come his way, be it from his father, Jaren Jackson Sr., who played a decade in the NBA, veteran teammates and coaches who surround him daily or a certain legend who has taken a personal and genuine interest in Jackson’s progress. I wonder if I may have had some influence on [Jaren], because I know the guys that came before me that influenced me. Garnett taught Jackson a few tweaks to his game for the second half of the season. The repertoire included improving Jackson's footwork on his turnaround baseline jump shot, keeping the ball high on post moves in the paint and, of course, the “grasshopper” setup when facing defenders on the perimeter. Garnett also encouraged Jackson to embrace a vocal leadership role despite his rookie status. It’s particularly prudent and timely advice, especially as the Grizzlies consider fast-tracking a rebuild around Jackson. Garnett invited coach J.B. Bickerstaff into the film session with Jackson. Garnett wanted to make sure his message to Jackson aligned with what the coaching staff was communicating, with all on the same page. “I pulled Jaren into my office and told him the same thing,” Bickerstaff assured Garnett. Then Garnett issued a specific assignment for Jackson. Three days later, after being outscored in the third quarter of 12 consecutive games, the Grizzlies played that period to a tie Friday against Sacramento and outscored the Kings overall in the second half but still fell 99-96. A dejected Jackson remained motionless on the court for several seconds after the final buzzer. Later in the locker room, the typically spirited Jackson voiced his frustration as strongly as he had all season. The next night, on the second end of a back-to-back set, Memphis held off a late rally to beat the Pacers as Jackson, Conley and Gasol combined for 60 points, 17 assists and 17 rebounds. It’s clear that some of the pointers from Garnett are gradually paying off for Jackson. And before he left town last week, Garnett extended a vital reminder to his mentee during what, coincidentally, happens to be the final days of National Mentoring Month. Jackson has since reflected on the biggest lessons he learned from Garnett’s latest check-in. Jackson took a step or two, then turned and spoke up again. It’s also how you blossom after learning from one of the best to ever do it.